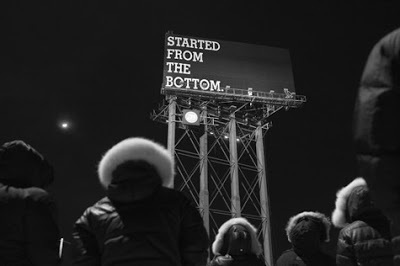 New music video from the 'Take Care' rapper Drake, 'Started From The Bottom'. The YMCMB rapper won a Grammy award last night for 'Best Rap Album', 'Take Care' (congrats Drake) his first ever Grammy. His third studio album is to be released sometime this year (keep a look out). The 'Headlines' rapper has announced the title to his third album. Following his 2011 release 'Take Care' comes 'Nothing Was The Same' which Drake plans on releasing this coming Summer under Young Money/Cash Money/Universal Republic records. The album will feature a lot of production work from Drake's long time friend and producer Noah '40' Shebib, and is currently being recorded in both Toronto and Los Angeles. Drake ~ Started From The Bottom from OctobersVeryOwn on Vimeo.